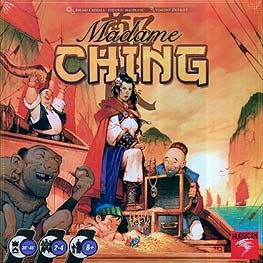 As a pirate captain in the service of Madame Ching, chart your course and go on expeditions in the far-off seas of China. Exploit helpful encounters, avoid the attacks of your fellow pirates, and learn new skills to take command of the ultimate prize - the infamous China Pearl, flagship of Madame Ching herself! Will you choose the best moment to turn back home with your hold fill of gold and gems, or push on to Hong Kong and plunder the city? You decide - but choose well, for only one pirate can be the favourite captain of Madame Ching!